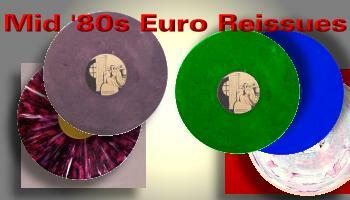 The German reissues began in 1984 with the release of a white/multicolor LP with blank silver labels in a deluxe red cover. It was followed in 1985 with a green vinyl LP with fake TAKRL cartoon labels, and a third issue on blue vinyl (LB-8). In 1986 it was released on a great looking grey/maroon marble vinyl which also had the fake TAKRL labels.